Fleas on cats without cat flea control can wreak havoc with your cat's health when you aren't using a cat flea tick medicine or other cat fleas control item. Life-threatening anemia, a severe allergic condition, and tapeworm infestations are all in store for cats with fleas. It helps to understand that the cat fleas, the fleas on cats, are only tiny insects which, when magnified, look a lot like a miniature grasshopper. Although cat fleas don't have wings, they have a three-part body, a hard outer shell made up of a substance called chitin, and six pairs of legs. Their rear pair of legs is especially large and impressive, and gives them their well-known leaping ability. Ctenocephalides felis, the common cat flea, can jump as far as 13 inches, more than a 100 times the length of its own body. Although more than 250 species of fleas have been identified in North America, only a few of them are ever encountered by humans. The specific cat fleas on cats are by far the most common, and is the species usually found on both dogs and cats. Ctenocephalides canis, the dog flea is rarer. Fleas on cats have a complex life cycle that begins when a female flea, having just dined on your cat's blood, begins laying her eggs within the fur. She'll deposit her eggs in groups of 1 to 18, and can lay as many as 25 per day. Before the end of the female's life she'll have laid as many as 1,000 eggs. The eggs are smooth, shiny and round, and they slip through your cat's fur to the floor, falling into the carpet and bedding or rolling into cracks. They'll hatch within 2 to 21 days (faster when it's 65-80 degrees). From the eggs emerge tiny white larvae about 1/4" in length. They are covered with fine hairs and look like tiny caterpillars. They burrow quickly into crevices and dine on the organic matter they find there: dirt, dust, their own eggshells, and the feces of adult fleas. Over a few days to months, the larvae grow through three stages, shedding their skins and becoming larger and more developed with each stage. Eventually, the "third stage" larvae spin themselves cocoons of silk, where they remain for as little as one week or as long as one year. These sensitive new fleas wait until they detect warmth, carbon dioxide, or vibrations...all of which might signal the presence of your cat. Then they emerge from their eggs and go looking for their first feline victim...and the result is fleas on cats. The flea's life cycle is highly versatile, which accounts for their success at reproduction and survival. Adult fleas can live for several years and go without feeding for several months. They can breed from two weeks to two years after emerging from their eggs and eggs can even with stand below-freezing temperatures for short period of time. If your cat becomes unavailable, the flea will simply seek out and dine on another host, such as a dog or human. If fleas are present in large numbers on your pet, they often congregate just in front of the tail, or around the head and neck, where they are safer from your cat's grooming efforts. If the fleas on cats are difficult to find, the feces and eggs it leaves behind are more conspicuous. Flea feces consist of digested blood, and are often excreted as a dark bit of spiral-shaped material easily mistaken for grains of dark sand or particles of dirt. Using a flea comb you can gather some of it (if your cat has fleas) and dab it with a wet cotton ball. Red blood-like streaks from the granules are a sure sign that you've found flea feces. Too often, it's not the signs of the fleas, but the symptoms of your cat that you first notice. Kittens are especially vulnerable because they have a smaller blood volume and scant reserves of iron for building new red blood cells. Fleas on cats are also responsible for the most prevalent allergic condition of cats (and dogs). Flea Allergic Dermatitis or F.A.D. 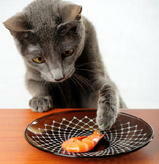 Although cats can develop the disorder at any age, the most common age of onset is 3 to 5 years. Afflicted cats often develop a pattern of skin damage which vets refer to as "military dermatitis", characterized by loss of hair and multiple small scabs around the cat's neck, in front of his tail, and on his belly. Other allergic conditions and parasitic infestations can also cause this pattern, but F.A.D. is the most common cause. It can make a cat truly miserable and while the symptoms can be relieved with antihistamines, anti-inflammatory drugs, and antibiotics (for bacterial infections), the best treatment is removal of the fleas with an effective cat flea tick medicine. The bite of only one flea can be enough to set off the allergic reaction in a cat who suffers from FAD. 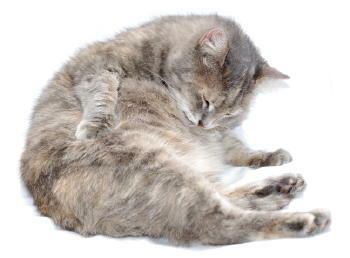 Fleas on cats are not just a nuisance but a health issue. But as damaging as the flea can be to your cat, some of the products sold to treat fleas on cats can be even more dangerous when used improperly. Using too much of a chemical, using it too often, or using a chemical which should only be used on dogs are the most common mistakes. 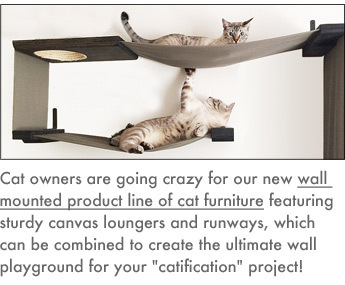 In order to treat your cat with the right product, in the right manner....don't forget to get your vet involved. The vet can prescribe the newer, safer, more effective drugs that are available for your cat. Our vet prescribed Revolution when we had a flea problem a few years ago. The manufacturers of Revolution, Frontline, Advantage and Program, understand the complexity of your cat's flea problems and try to distribute their drugs through veterinarians. Program is a drug called lufenuron. It can be given to cats as an injection every six months, or as an oral paste or tablet, mixed with food and given monthly. When a female flea bites a cat treated with lufenuron, the eggs she lays never develop into new fleas. So the next generation of fleas never come to life in your home. If your cat has a more severe problem, you'll probably want a product that kills the existing adult fleas. Advantage (by Bayer)is the drug imidactoprid, and fipronil is the drug marketed as Frontline. These products are very similar. Both are applied to your cat's skin and absorbed into the skin and hair. Both kill fleas and flea larvae on contact by damaging the nervous system of the insects. They even keep working if you give your cat a bath to get rid of the gritty flea feces. They eliminate the fleas on your cat within 24 hours and keep working for about a month. They are safe for your cat and for you. The newer drug selamectin was developed by Pfizer for sale as Revolution and it is applied the same as Frontline and Advantage. It is safe for use in kittens as young as six weeks of age. It has the added effect of treating and preventing hookworms and roundworms (intestinal parasites of cats) and ear mites. Natural doesn't mean better when it comes to flea remedies. Flea prevention and cat flea control products are a good example because most of the products, until the last decade, could be considered natural products. One of the most common insecticides used against fleas was pyrethrin, a derivative of the chrysantheum plant. Sounds fine, doesn't it? 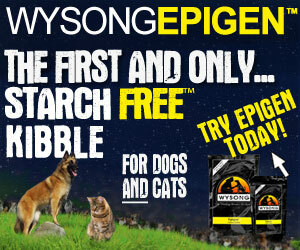 But pyrethrins can be quite toxic to some cats, depending on how they are used and the health condition of the cat. Another flea insecticide, rotenone, is derived from the root of a plant called Derris ellipta, it too is quite toxic and will cause a cat ingesting it by grooming its fur to vomit. Pennyroyal oil is derived from the leaves and flowers of the penyyroyal, squaw mint, or mosquito plant, it has been included in shampoos and powders, and some cat owners have purchased it in health food stores to apply to their cat. This natural compound is highly toxic to cats and may result in depression, vomiting, liver damage, seizures, and even death. Not all natural products are toxic or ineffective. D-limonene is a volatile oil derived from citrus fruit and found in may flea shampoos. Although it does not have long term effects, it has a high margin of safety and quickly kills fleas on cats when used properly. Fleas on cats also can infest your cat, internally, with a tapeworm.